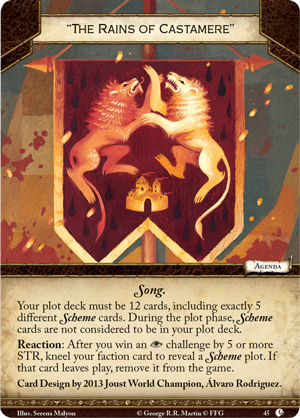 Fantasy Flight Games is proud to announce The Brotherhood Without Banners, the sixth Chapter Pack in the Blood and Gold cycle for A Game of Thrones: The Card Game! The tumult of the War of the Five Kings shook the foundations of Westeros, fracturing the peace that had endured since Greyjoy’s Rebellion. 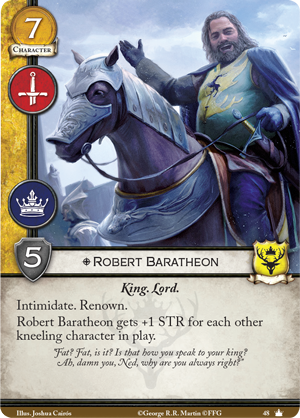 In this new war, the Great Houses were forced to choose sides, some supporting Renly or Stannis Baratheon, others lending aid to Robb Stark, Joffrey Baratheon, or Balon Greyjoy. Yet there are also those who fight for no king, but for the people. To some, they are no more than outlaws, but for others, these men and women are champions and heroes—true knights. Take up arms with outlaws in The Brotherhood Without Banners, the sixth Chapter Pack of the Blood and Gold cycle! 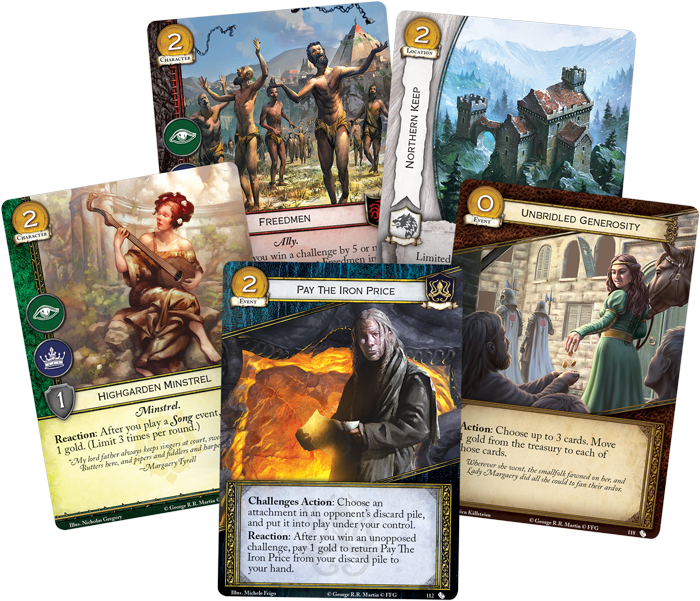 As the cycle draws to a climactic conclusion, you’ll have the chance to see the themes of the cycle more fully realized, with new economy cards and new support for the bestow keyword across all eight factions. Whether you’re serving the Night’s Watch with Donal Noye or leading the brotherhood with Beric Dondarrion, this expansion has plenty to offer, including a brand-new agenda inviting you to join the brotherhood without banners. 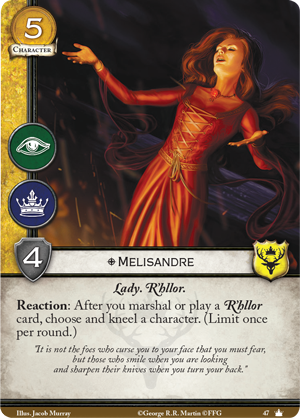 Choosing an agenda for your deck is one of the most crucial decisions you’ll make while deckbuilding for A Game of Thrones: The Card Game, and there are obvious reasons why that’s true. 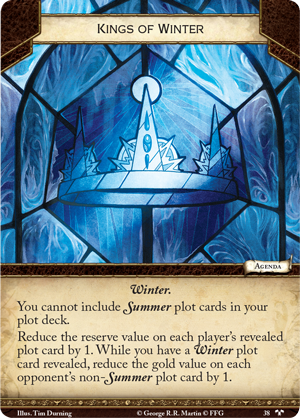 Your agenda decides the focus of your entire deck, whether you’re choking your opponent’s economy and reserve with Kings of Winter (Called to Arms, 38), revealing unexpected Schemes with "The Rains of Castamere" (Lions of Casterly Rock, 45), or pursuing some other route to victory. In The Brotherhood Without Banners expansion, a new agenda enters the game, and it immediately opens the door to a wealth of new decks. Yet from its first line, The Brotherhood Without Banners (The Brotherhood Without Banners, 119) agenda immediately sets itself apart from every other deck that you may choose to create. If there’s been one constant across all agendas released so far, it’s that you can rely on the aid of your main faction’s most iconic characters. 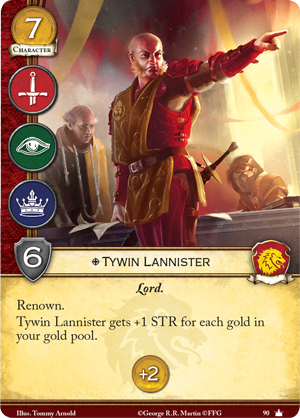 House Lannister can always call upon Tywin Lannister(Core Set, 90), for instance, while House Baratheon has the sole privilege of fighting alongside Robert Baratheon (Core Set, 48). All of your old alliances change, however, when you join the brotherhood without banners—this agenda prevents you from including loyal characters in your deck. Ultimately, what you gain from The Brotherhood Without Banners is a supreme versatility as you approach the challenges phase. If you’re short on cards, you can grant insight to draw more cards. If you need power to close in on the win, you can gain renown. Or, if you need help to push challenges past your opponent’s characters, you can grant one of your own characters intimidate or stealth. No matter what the current state of your game, The Brotherhood Without Banners can offer a powerful benefit. The one thing that you need for The Brotherhood Without Banners to have its full effect is a healthy supply of neutral characters. After all, if you’re caught without any neutral characters in play, your agenda offers you nothing. 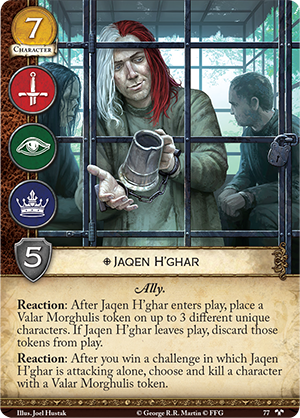 Characters like Jaqen H'ghar (There Is My Claim, 77) are natural fits, though one of the best ways to use The Brotherhood Without Banners, at least initially, is with the Wildlings. It’s easy to see the benefits of giving intimidate, stealth, insight, or renown to powerful characters like Rattleshirt (Watchers on the Wall, 39) or Crow Killers (Watchers on the Wall, 41). Still, there are few characters better suited to this agenda than the leader of the brotherhood— Beric Dondarrion (The Brotherhood Without Banners, 117). 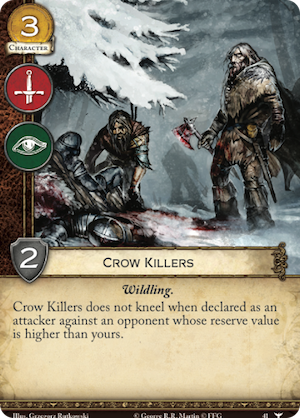 Designed by 2014 European Melee Champion Jakob Hultman, Beric Dondarrion is a formidable leader for your characters—not least because of his near-immunity to death. 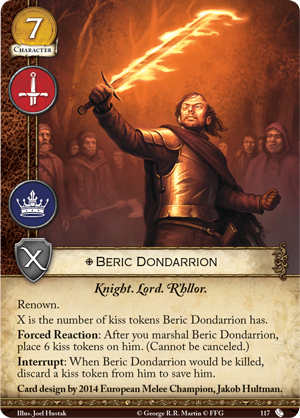 When Beric Dondarrion first enters play, you’ll place six kiss tokens on him. Then, whenever Beric would be killed, you can discard a kiss token to save him! 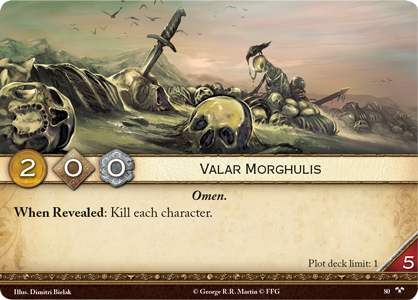 Removing these kiss tokens reduces Beric’s STR, but if you’re surviving Valar Morghulis (There Is My Claim, 80) or absorbing military claim without sacrificing your board, the kiss of life is a small price to pay. Just like in A Song of Ice and Fire, Beric will keep on fighting for your cause long past when lesser men would have given up and died. It’s also important to note that Beric Dondarrion bears the R’hllortrait. 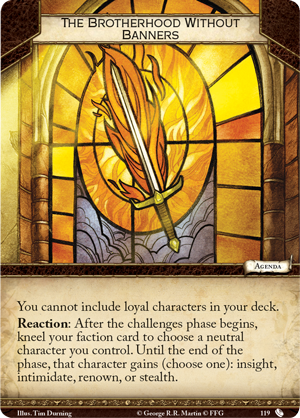 Beric’s devotion to the Lord of Light means that he works perfectly with Melisandre (Core Set, 47) to keep your enemies knelt. 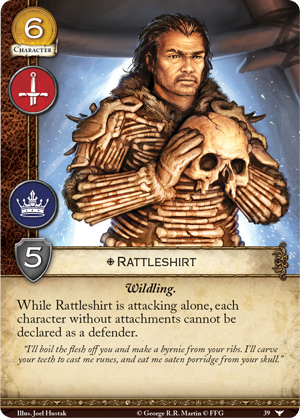 As more brotherhood characters swearing allegiance to R’hllor enter the game, you may find one of the best homes for The Brotherhood Without Banners in allegiance to House Baratheon.